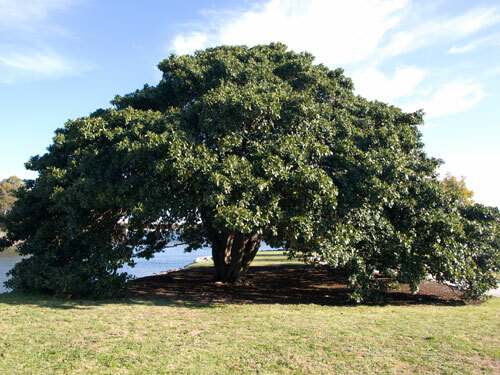 You are currently browsing the tag archive for the ‘Fig trees’ tag. 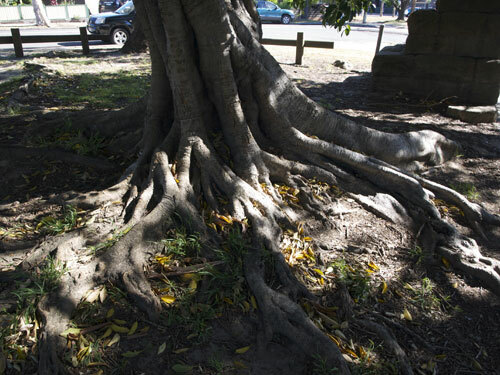 The lovely Fig in Richardson Reserve Marrickville South. Happy Christmas. I hope you are having a nice day with no worries. People gathered hear talks about the project under the beautiful fig tree that was saved from death by brackish water & erosion. Here is a photo I took in 2014 of the same tree showing the erosion and exposed roots. Looking at the saved Fig tree, the habitat area and up the Alexandra Canal from the lookout area. On the far right is a great model that shows how stormwater travels along hard surfaces. A close-up of the restored bank. 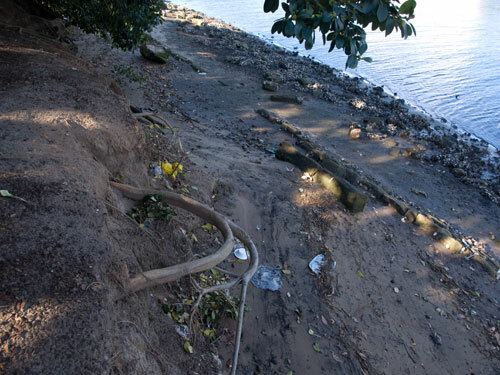 Plants have been placed in slots and below the current tide line, intertidal block pools have been created. These all offer habitat for a range of creatures. 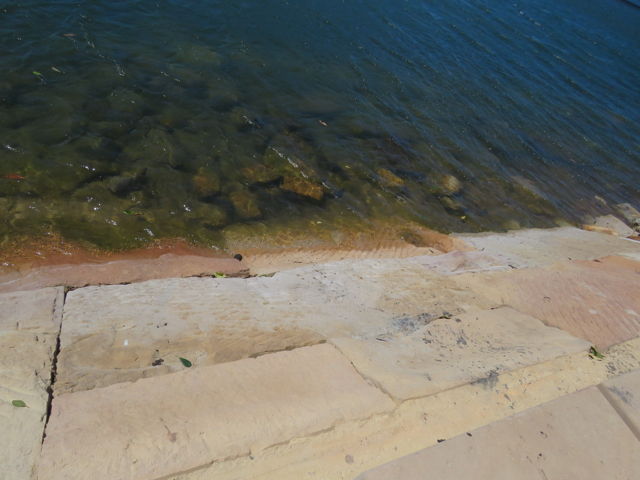 The sandstone blocks have been left in the river to continue their work offering habitat. This morning I went to the Community Open Day celebrating the newly upgraded Alexandra Canal & other works beside Tempe Recreation Reserve. The event was opened by an indigenous man who said the area was near enough to the meeting point of three indigenous tribes. After a short speech about the Cooks River, he welcomed us to Country. 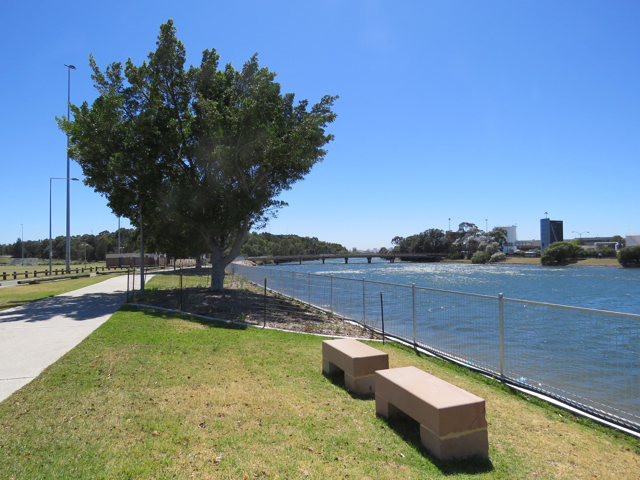 Then representatives from Sydney Water & the contractor Total Earth Care each gave short talks explaining what they had done with the river bank. They appeared very happy with the outcome & so they should be. It looks excellent. I asked how long the work on the banks should last & was told it will see us all out. I think it is wonderful that this restoration work will be long-lasting. I am used to seeing work all around the place last a decade if that. I had other commitments, so was not able to stay for the full program. Unfortunately, I missed what promised to be a very interesting talk about the indigenous history of the area, plus actual exhibits. I also missed a talk & showing of a variety of animals & insects that Taronga Zoo brought to the park, though I did get to see a gorgeous echidna before their talk. 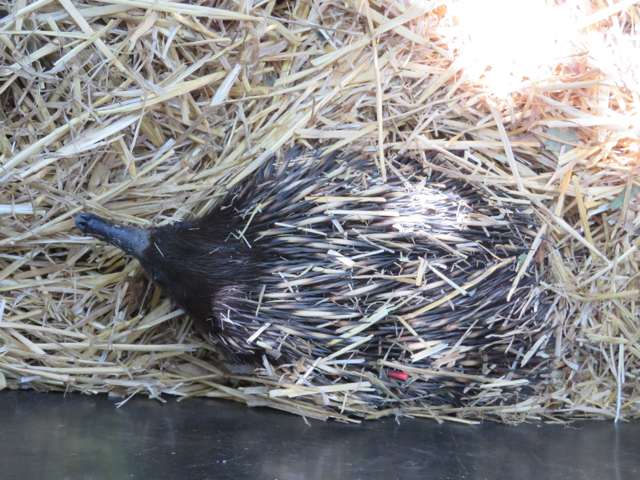 It was very windy, so the echidna wanted to burrow in hay & get out of the wind, but I was lucky enough to get a photo of him. 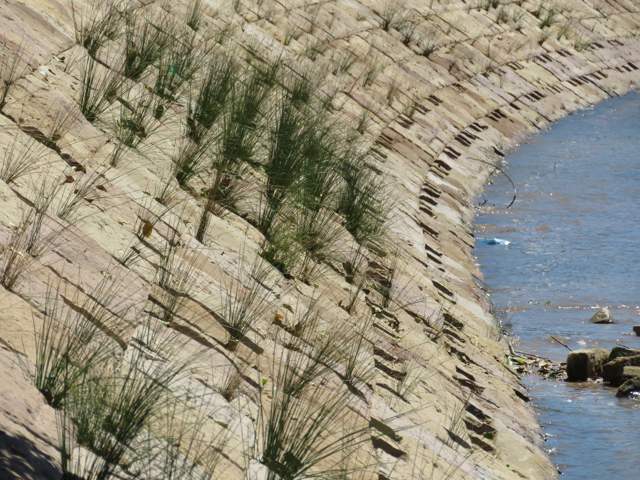 So what is the restoration like & why all the fuss about a river/canal bank? 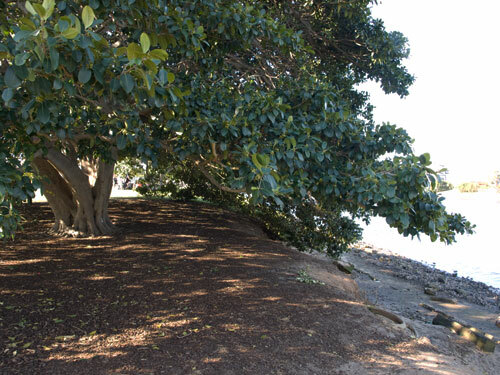 Firstly, the lovely & significant Fig tree that was badly affected by erosion & had many roots submerged in brackish water every time the tide came in is now sitting pretty in thickly mulched soil as it should be. It is now one happy tree. Had the erosion continued, it is highly likely we would have lost this tree. It has a beautiful bowl-shaped canopy that reaches all the way to the ground – something we don’t see much in this area anymore. 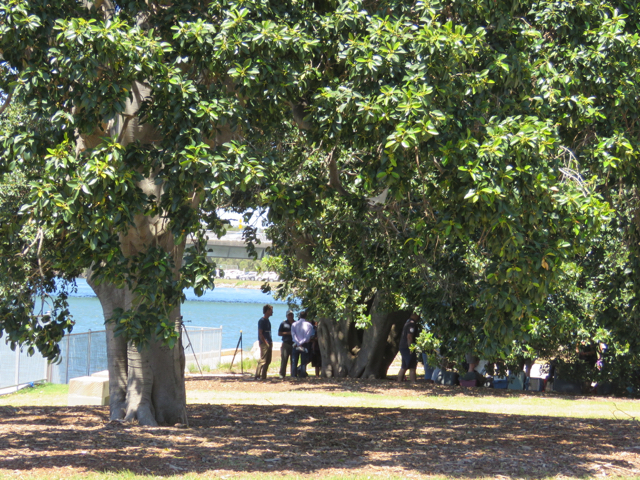 The area between this tree & another large old fig tree on the point has been made into a garden habitat area & lookout with signage that explains the work done, the ecological significance & also the history of this area. I think the signage is excellent, as it may change the culture of many who use this park by encouraging them to respect the park & the river. I’ve noticed minimal vandalism & littering at Cup & Saucer Creek Wetland & also the bank restoration work in the same area – both major restoration works by Sydney Water. People read the signage & learn how important to the river & the wildlife this work is. The outcome has been negligible rubbish left behind & signs, structures, seating & re-vegetated areas have been mostly left alone & not destroyed or graffitied. I hope the same level of respect happens here in Tempe Recreation Reserve. From the lookout area you can see right along the curve of the bank with all the new sandstone & slots that hold plants. It looks fabulous. 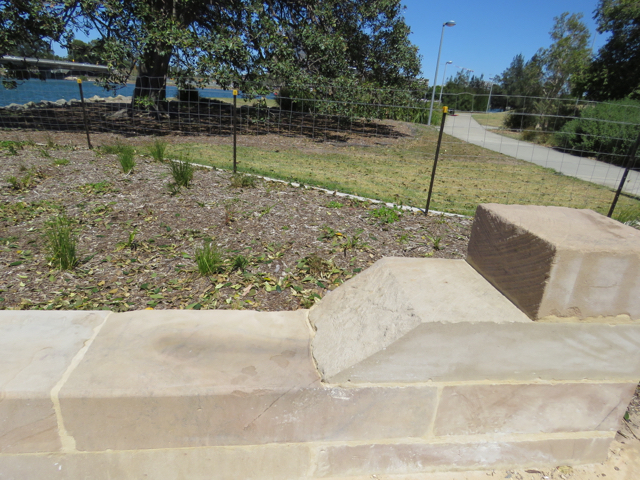 I had a chat with the contractor & was told that they used 1,742 slabs of sandstone to complete the work. Each slab was hand-cut into eight pieces. These were then laid to form the wall. Each slot in the wall was also hand-cut. To me this is a significant feat. 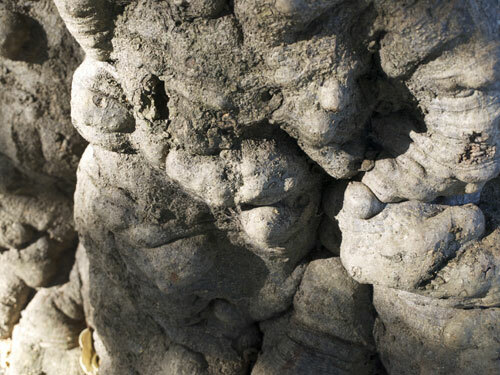 Some of the slots create intertidal block pools – places for small fish, seaweeds, snails, shellfish & small crabs to live. Block pools have also been created above the tideline to cater for any future sea level rise. When you look at the wall, each slab has its own unique markings. It’s quite attractive. The slope of the wall also allows birds to perch safely away from people. Crabs will benefit too. The work is much more than saving a significant tree, restoring the bank & building a lookout area. 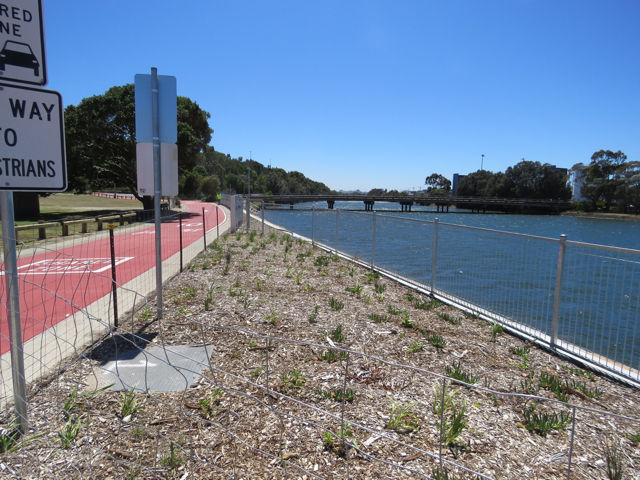 Sydney Water has done re-vegetation work all the way to the bridge over the Alexandra Canal. 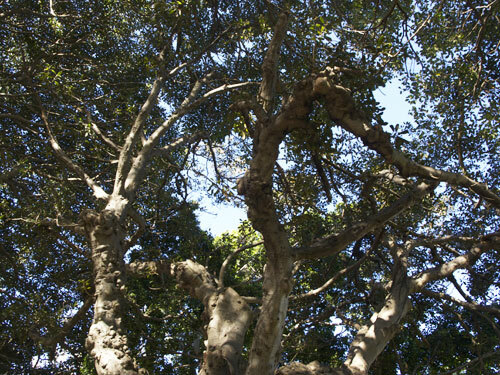 They created curved garden habitat areas that swing around & encapsulate the fig trees, surrounding them with mulch & plants, therefore protecting them from people. I like this very much. Many of the trees have repeatedly had bark gouged out by people of all ages intent on engraving their initials. This is a relatively new pastime, starting only a couple of years ago. 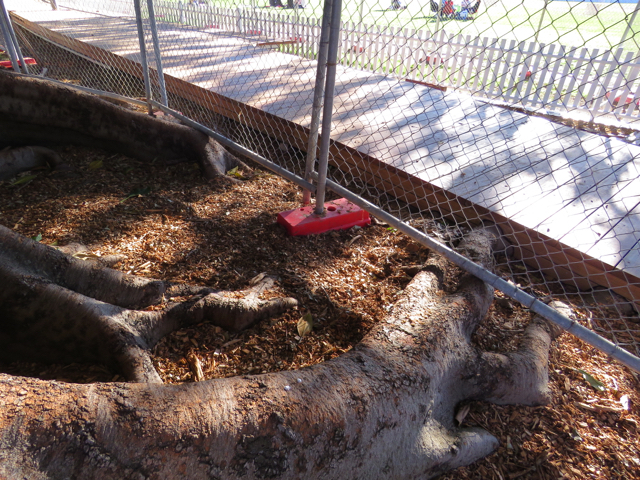 I’ve seen kids standing at the tree using kitchen knives to cut into the trunk while adults looked on. Damaging the bark is a very quick was to introduce disease into trees & can bring about their early death, so I am very pleased that the tree trunks are now protected by plantings all around them. 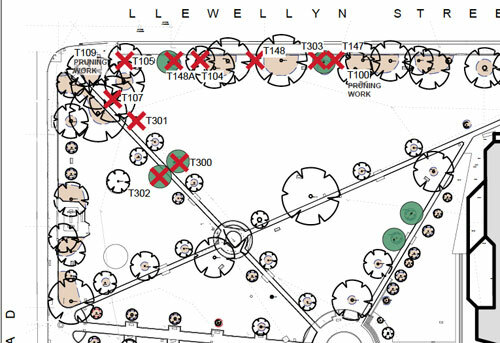 The tree canopies are big enough to provide shade on the lawn areas outside of the garden areas, so picnicking people will still be able to access much needed shade. A range of native plants have been planted & a good number too. It is not stingy planting. It looks good now, so will look terrific once grown. The work makes this area look maintained & cared for, which also may change the culture of some who use this park for recreation. I imagine it will be harder to leave lots of garbage behind when it is obvious that a lot of work & money has gone into making this a beautiful place. Here is hoping anyway. It would be nice to be able to spend time in this park without feeling upset at the amount of garbage left around or blowing into the river. All the fences along the canal have been replaced & they are attractive to look at. Fences are needed here to keep people safe because the bank is steep & the drop is dangerous. Fences will also stop people from driving their car to the bank & launching their speedboats into the river at this location. 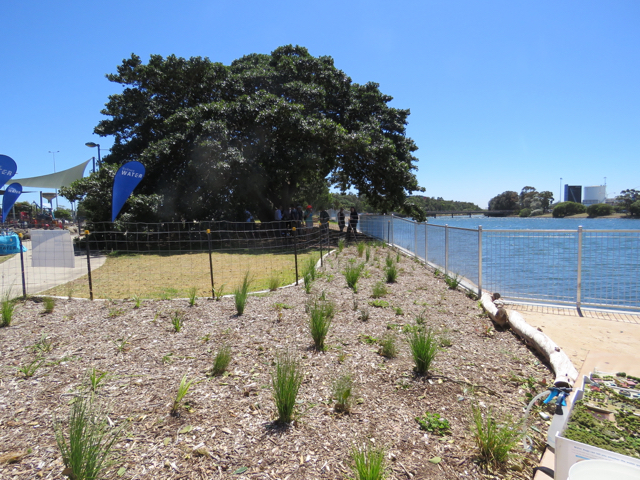 All in all, Sydney Water & contractor Total Earth Care should feel proud of what they achieved. The community has benefited by this major improvement to our park & the wildlife now have additions that will help improve their life. Beauty always lifts the spirit, so this work will make people feel happier after time spent here. I also think the work will educate people as to the importance of the river & its ecology. Hopefully, this will spinoff into respectful behavior toward the river & the park environment. Lastly, Tempe Recreation Reserve is highly visible from the Airport Drive. I am sure many thousands of people look & wonder about this park every day. Now when they are driving past they will get an excellent look at the bank restoration work & instead of seeing a rundown eroded area filled with weeds & junk, they will see beauty. The benefits will flow on further than just the users of the park. To me this is priceless. A massive thank you to Sydney Water & contractor Total Earth Care from me. You give me hope that one day the Cooks River & the Alexandra Canal will be restored & we will have a healthy river system once again. All work here is worth it many times over. 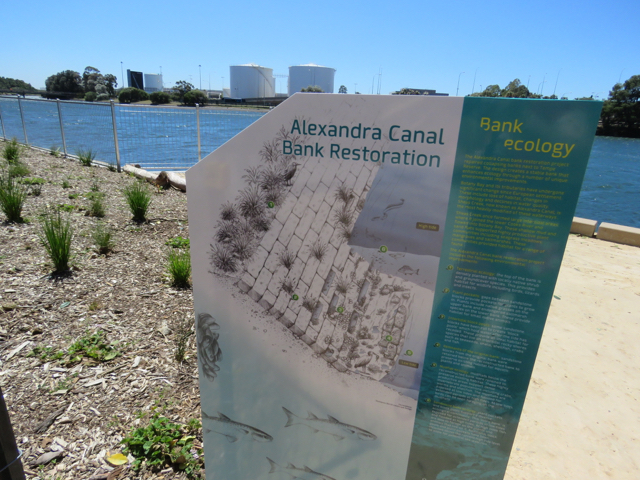 A section of the educational signage that shows the sandstone riverbank. 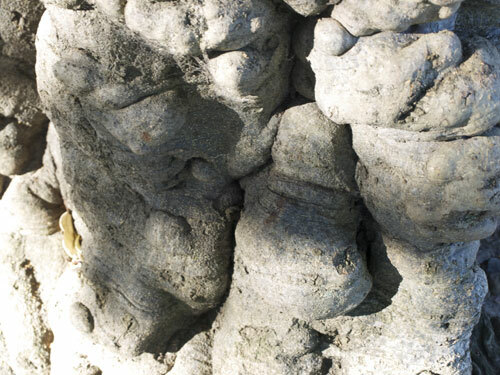 I was amazed to read that dugong bones with butcher marks had been excavated when the Alexandra Canal was constructed. Dugongs lived here about 5,500-years-ago. 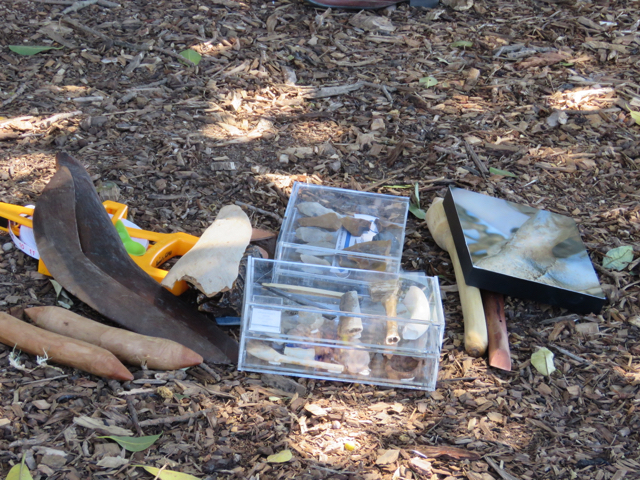 Lots of exhibits were bought along for the talk on the indigenous history of the area. The lookout area is surrounded by seating height sandstone blocks, which I imagine will be really popular. Two more sandstone seats were installed further along the Canal. They look great. You can see the garden area curve around the fig tree. Looking down at the new sandstone river bank at the lookout area. I think this looks very attractive. More habitat areas alongside the Alexandra Canal. This will look amazing once it all grows. The habitat area travels all the way to the bridge over the Canal. The bitumen road has been painted rusty red with signage saying that it is a shared zone. The whole area now looks cared for. Lastly, an echidna who came for a visit from Taronga Zoo. This is only the second echidna I have seen, so quite a treat. You can just see the raised wooden footpath on the right of the photo. The tree itself is magnificent. 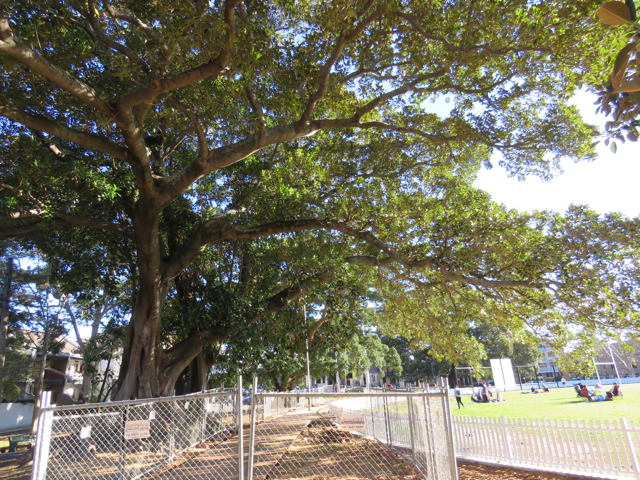 I was really happy to see that the Inner West Council is installing a raised wooden footpath over the tree roots of one of the significant Fig trees in Camperdown Oval. The tree is very special, so it is wonderful that such care is being taken to protect it. 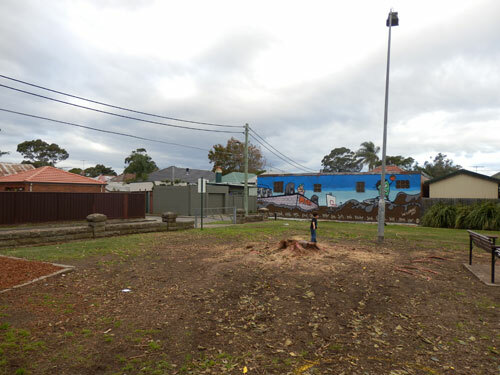 Apart from a Fig tree in O’Dea Reserve in Stanmore, that has a large area of raised decking around it, I have not seen this kind of work done around trees in parks of the old Marrickville municipality. I think this is a first raised footpath in the area. This is an excellent move & I hope it becomes a norm. 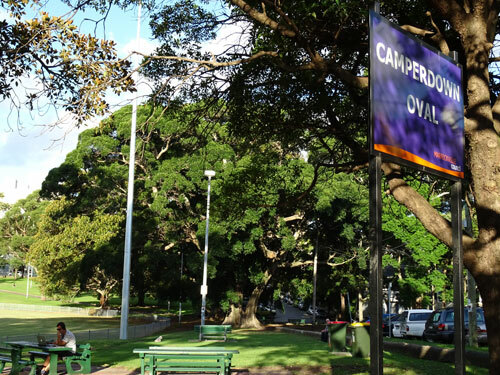 A lot of work is being done to upgrade Camperdown Oval. I will write about this later when the work is finished. It’s very nice to see more trees have been planted. The raised footpath – excellent to see such infrastructure when Council decide that a path must be placed in a certain area. The tree that is having its roots protected. The path can be seen in the middle of the photo. 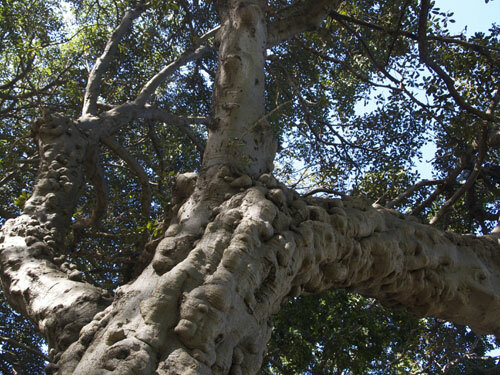 Part of the canopy of this Deciduous fig tree. I think it is glorious. 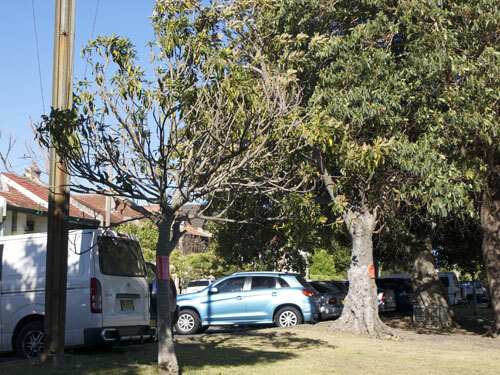 Marrickville Council has, for the first time as far as I am aware, used cables & braces to stabilize a tree, rather than chop it down. Showing the stainless steel bolt of the cabling system. 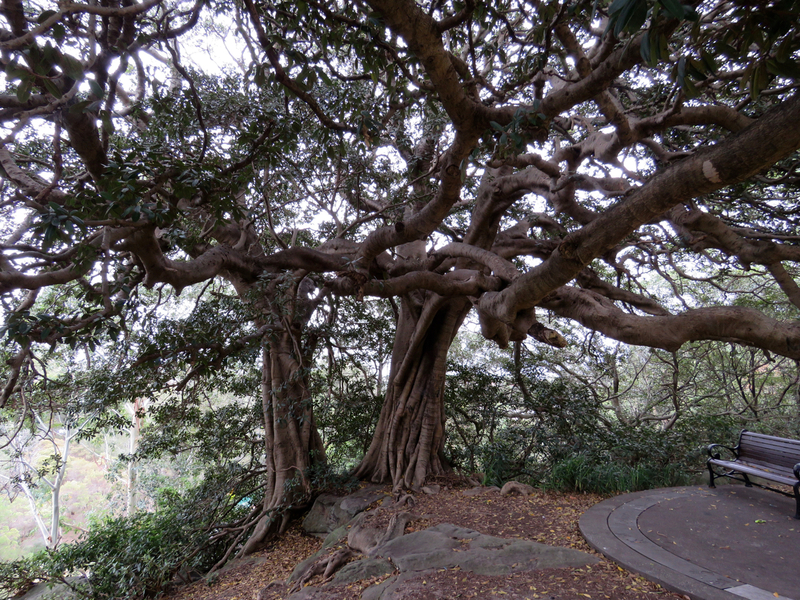 The tree is a 100-year-plus Deciduous fig (Ficus superba var henneana) that lives in the lovely Camperdown Park. It is a magnificent tree & totally worth the money & effort that has been put into retaining it. I applaud Marrickville Council for taking this management approach. 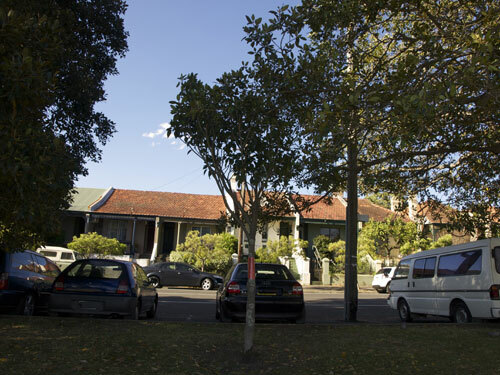 Council’s sign below the tree says it is one of only a handful known to exist in Sydney. The tree has a visible crack in the base of the trunk. The trunk has been braced & has a measuring gauge that I assume will allow Council to monitor the crack to see if it is growing wider. The brace will fortify the stem & should prevent further splitting. 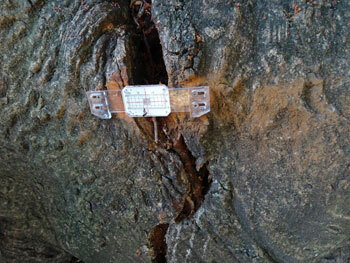 Showing the split in the trunk & the device that will monitor any further splitting. Let’s hope the vandals leave it alone. A number of stainless steel cables have been drilled through some larger branches & fixed with stainless steel bolts. These cables alleviate stress by supporting the heavy branches, especially during high winds. Another view of this very special tree. 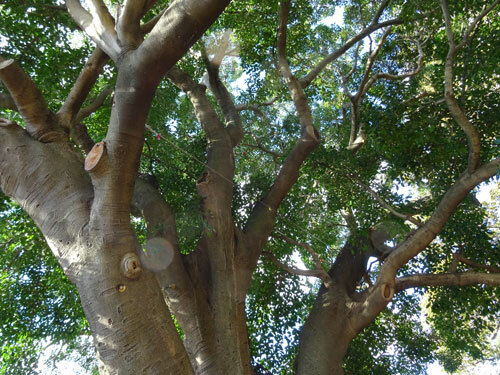 A number of branches have been removed to reduce the weight of the canopy & cables have been attached to branches to relieve stress on the tree. Such a shame as it has vigorous growth & is covered in fruit. 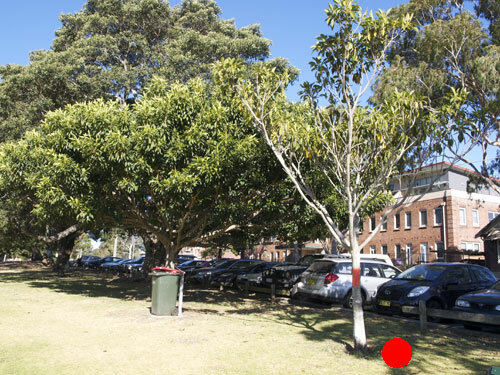 Marrickville Council has given notice that they intend to remove a Port Jackson Fig (Ficus rubiginosa) inside Enmore Park at Victoria Road frontage. “Tree has extensive internal decay. Subsidence split to a major limb. 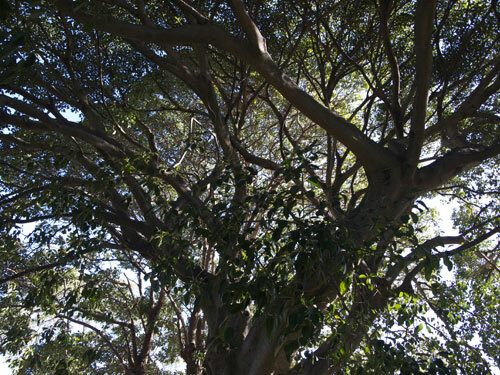 Two independent Arborist reports recommend removal. Tree poses a risk to public safety. 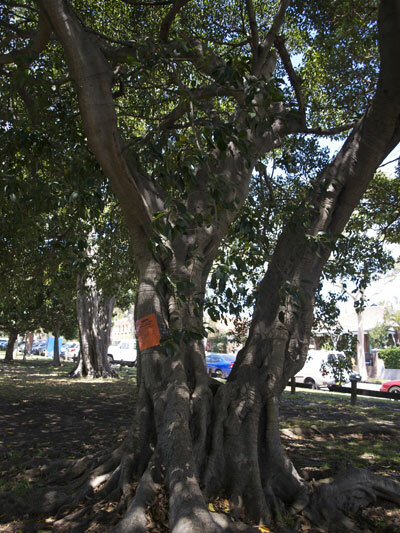 Council says they will replace with another Port Jackson Fig, but not when they will do this. This tree was on the original list for removal, but Council decided to investigate to see if it was suitable for bracing. Then the decay was discovered. The deadline for submissions is Friday 14th March 2014. I will not be putting in a submission. 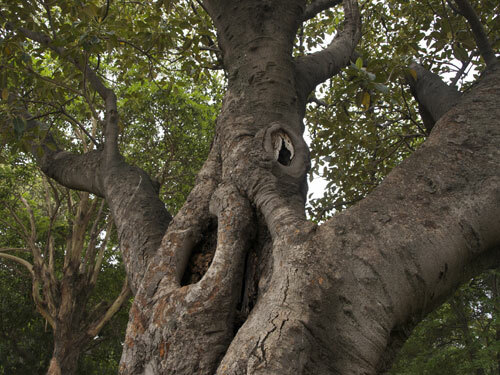 This is a beautiful Fig tree. It would be a shame to lose it. Side view. The erosion has reached past the canopy edge. 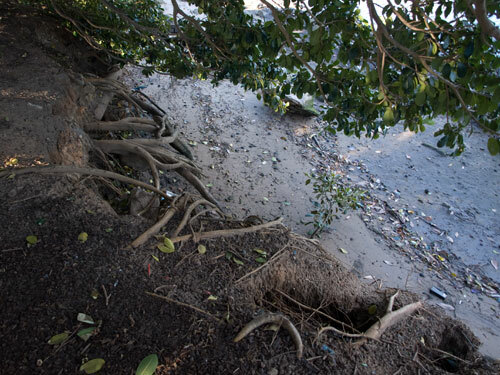 One of the old Fig trees on the point at Tempe Reserve is being badly affected by erosion. The stabilization works on the riverbank failed here with significant areas removed by river movement & high tides. The deeper roots of the Fig tree are visible & some have even turned backwards, obviously not liking bracken water. 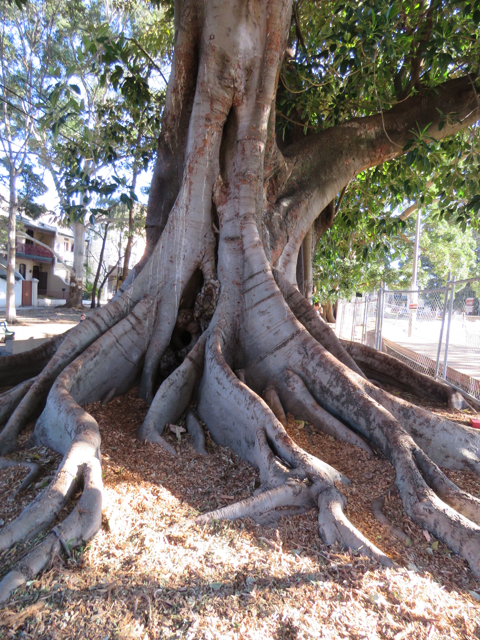 Marrickville Council would have been informed of this as part of the Tree Inventory completed in November 2012. The tree will die if nothing is done to repair the riverbank. This would be a great loss. 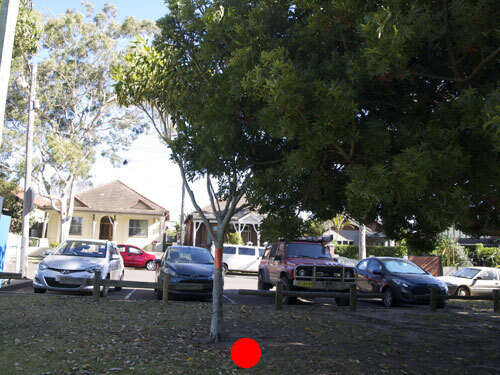 1st October 2013: I have learnt from Marrickville Council that the Tree Inventory did not include trees in parks. Therefore, I cannot say that Council will know of this particular tree issue. It feels quite empty in this section of Jarvie Park now. The child gives an idea of the size of the trunk. “The tree had a major branch (approx 40% of tree canopy) failure during a high wind event. 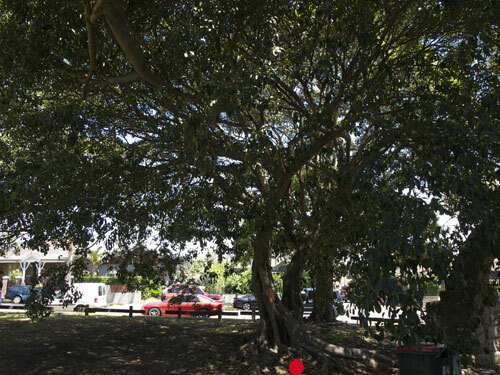 Council says they will replace with an 800L Moreton Bay Fig (Ficus macrophylla) in during 2013 planting season. What a shame. This was a seriously beautiful tree & its loss has left a big hole in the park. I am glad that Council is replacing with another Fig tree of an advanced size. May the new Fig tree go on to live a very long incident-free life. 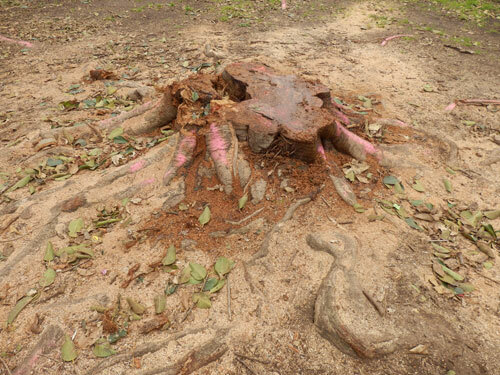 The stump – it is a big one. 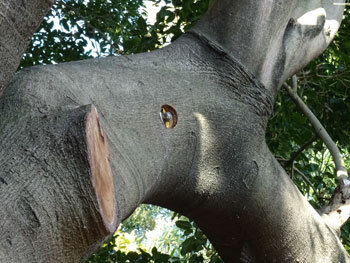 Fungus, plus visible rot & borer damage in this branch of the fig tree in Petersham Park. 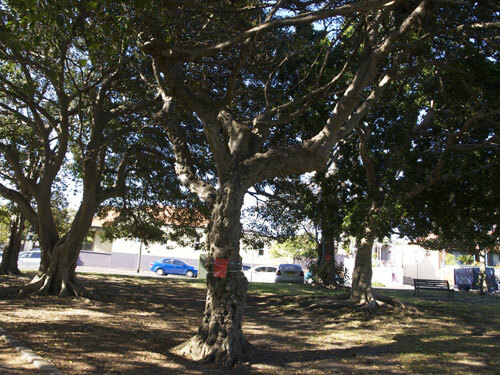 When in Petersham Park recently to see the Coral tree up for removal I saw a couple of very old Post Jackson Fig trees in a very sorry state. The one that really concerns me has visible areas of boring insect damage in a couple of its branches with two areas of fungus growing. In my experience the presence of fungal fruiting bodies of any kind means that Council removes the tree. 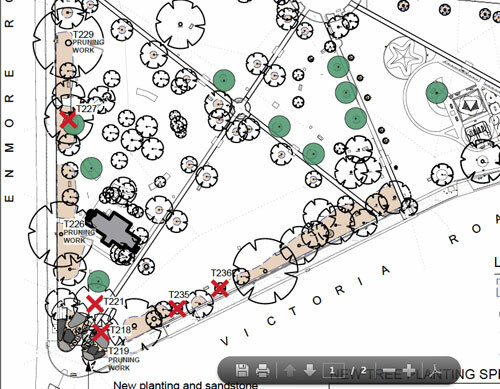 I looked up the Petersham Park Masterplan & these trees were not listed for removal. I also looked at the list of proposed trees for removal in Petersham & no trees in any Petersham park were included. 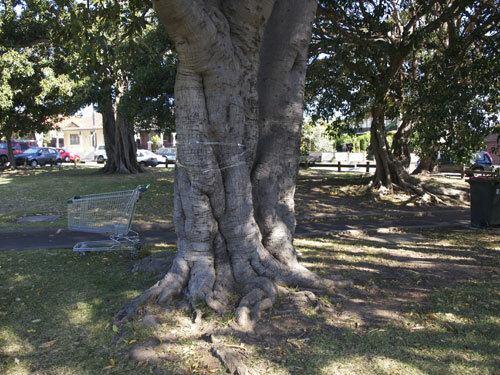 I am not even sure whether Council had any park trees included in the recent Tree Inventory. I hope they were assessed & that this information becomes available to the community. 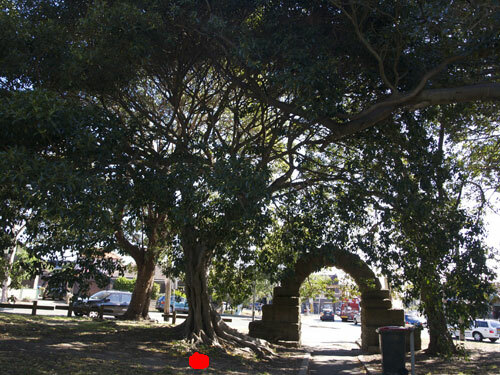 The Fig trees in Petersham Park, unlike those in Enmore Park, are not included in Marrickville Council’s list of heritage trees. 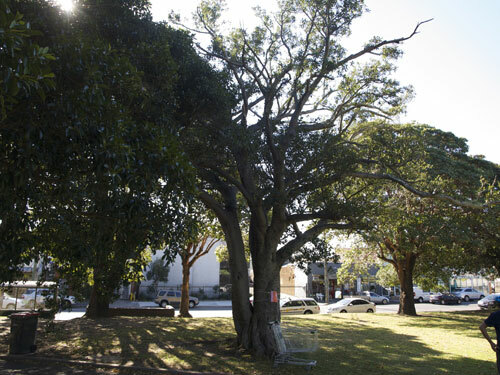 In my eyes this is a shame as Petersham Park is recognised as an historic park, the trees are old & surely there would be some that could fit the criteria for heritage protection. 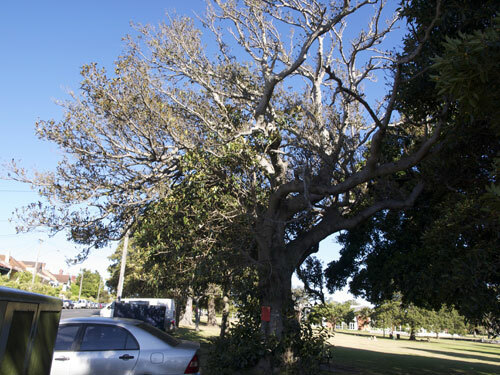 Looking at the borer damage, rot & fungus on this tree I wondered what, if anything, Marrickville Council was doing for this tree. 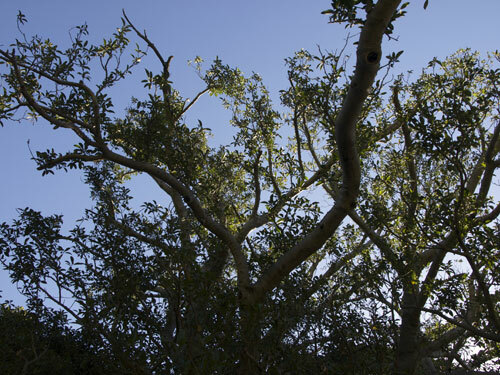 It doesn’t require a qualification in tree management to see that removing the affected branches would 1. remove any danger of these branches falling, 2. remove the areas of possible infestation & possibly catch the rot & borers before they infect the rest of the tree, particularly the trunk, 3. help the tree. 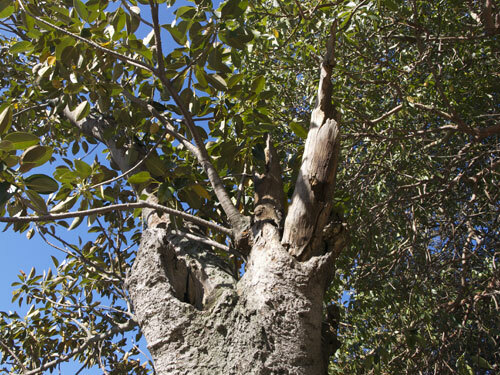 It may be that the rot has affected the trunk – or it may be that just a couple of branches are affected. 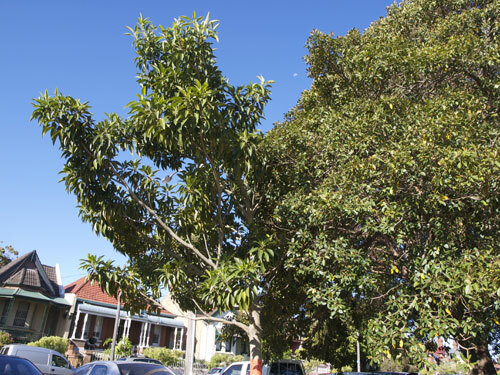 Council won’t know until they have the tree professionally assessed. Surely intervention by a Veteran Tree Specialist is better than doing nothing until the tree is so far gone that it needs to be removed. 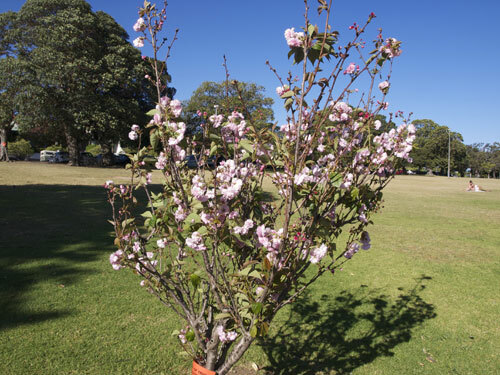 Maybe they have, though when I last spoke to one of Council’s Tree Managers, he said something along the line of – Council doesn’t have the time to give this kind of care to trees. 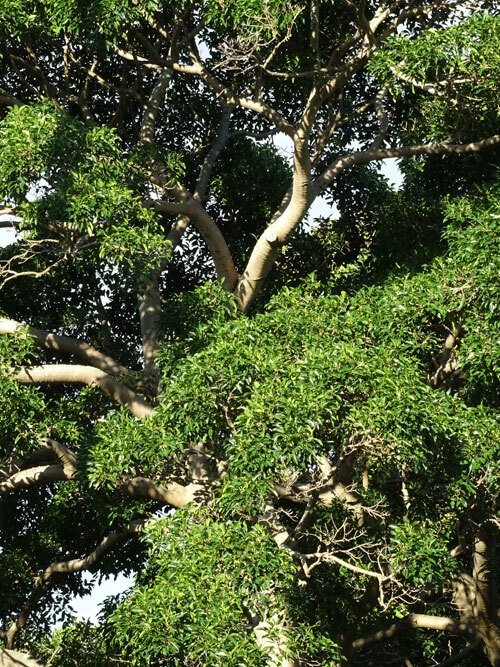 This tree reminds me of the boring insects that are working their way along many of the trees alongside the Cooks River. When one Poplar dropped a branch a couple of years ago because of boring insect damage, the branch was removed, but nothing was done to help the tree. 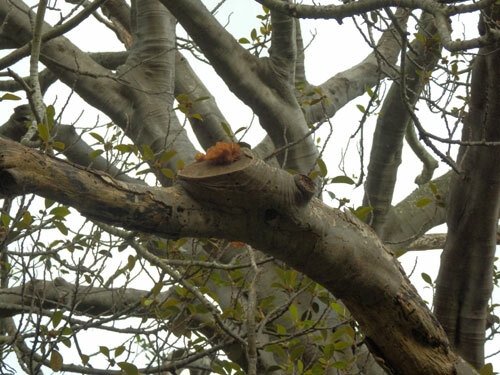 The remainder of the branch has been left as a jagged mess when it could have been pruned to minimize the risk of decay agents & remaining boring insects entering the wound & the trunk. I guess it depends on how important mature & old trees are considered. Three of the heritage listed Canary Island palms along Carrington Road in Marrickville South have died in the last 3-years. You could see them struggle during the long drought. The grand Hill’s Figs one block up that were once a major beauty in the area have had the roadside branches removed over the last 2-3 years leaving lob-sided trees with ‘risky’ epicormic growth. Too late now for the aerial bundled cabling used to remove the need for such radical pruning. 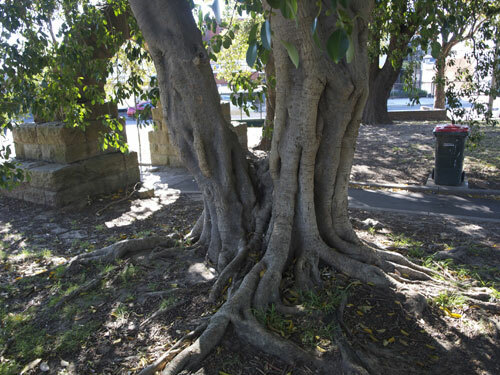 The Hill’s Fig trees in Renwick Street just around the corner are also struggling, but has anything been done to help these trees? Instead it looks like a couple of Lilly Pillies have been planted for succession planting. Two to three years ago these Figs were in peak condition. Does it matter? I think it does. 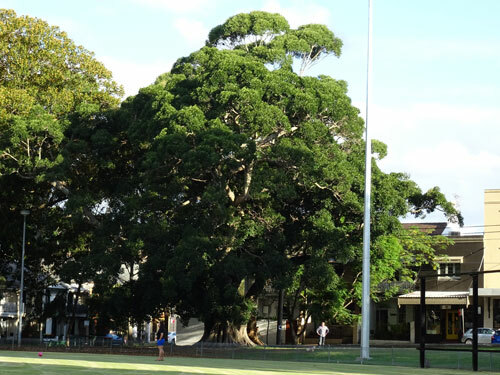 The community generally loves older, or big or historic trees. They link us to our past. They act as landmarks. They are often awe-inspiring & they are often beautiful. Even when they are not as beautiful as they once were, they still attract our attention & often our admiration. Of course there are those who don’t even really notice trees, see them as pests & would not understand how one could find a tree awe-inspiring, but there are plenty who feel like I do. I’ve noticed that as the community changes in our municipality there are more people who think like me. Trees can make a neighbourhood. They can be fantastic or they can barely make an impact on the streetscape. I know that many in the community consider all the trees that I have mentioned as special. It would be a crying shame to ignore them until it is too late. Another type of fungus growing on another branch of the same tree in Petersham Park. 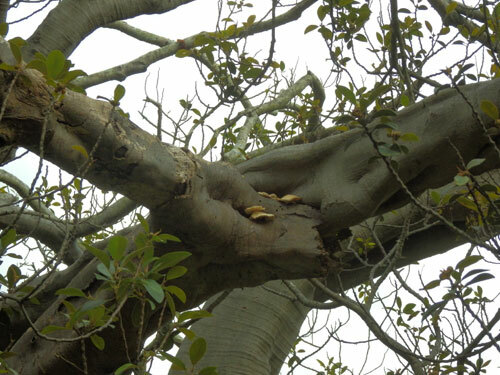 Borer damage & rot is also visible on this branch, while other branches appear unaffected.